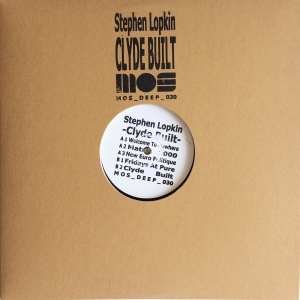 Having released two EPs on the label since 2014, Stephen Lopkin now steps up to MOS Deep with a 2x12" release entitled Clyde Built, recorded in his home town Thornliebank. The Scottish artist has been making prickly house and techno for almost a decade. His style is serene and slick, and across the 10 tracks here he manages to conjure tracks that work in the club but that come with plenty of cerebral qualities. 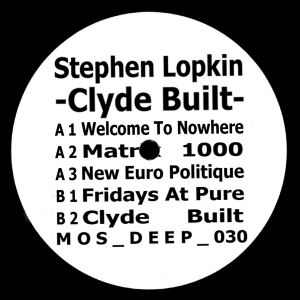 He never made a secret he takes a lot of influence from early Detroit Techno, several track titles pay direct homage to his musical heroes like Derrick May, Kevin Saunderson, Carl Craig and also the track New Euro Politique is made in memory of the late UK producer Matt Cogger aka Neuropolitique. 'Welcome to Nowhere' kicks thing off with languid house grooves and jittery percussion, 'Matrix' is awash with swirling pads and astral grooves and 'New Euro Politique' is a blizzard of kicks, panning percussion and arpeggiated synths that glows bright. There are darker, driving cuts like 'Fridays At Pure', trippy offerings like the title track and more thoughtful and pensive jams such as 'Qinosen'. The final three tracks are busy, electrifying pieces that fire every synapse with their sci-fi fx, crisp drums and cinematic atmospheres. The whole album is wrapped up in majestic synth work and every track reveals more layers with each listen. Offering a sublimely complex house and techno sound, these tracks look back to go forwards and do so with a real timelessness.